I had a lovely afternoon yesterday painting at Major’s Hill Park! 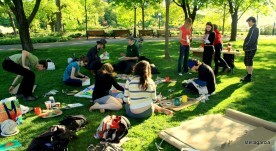 The Art Flash Mob event was organized by Project Y and sponsored financially by Awesome Ottawa. 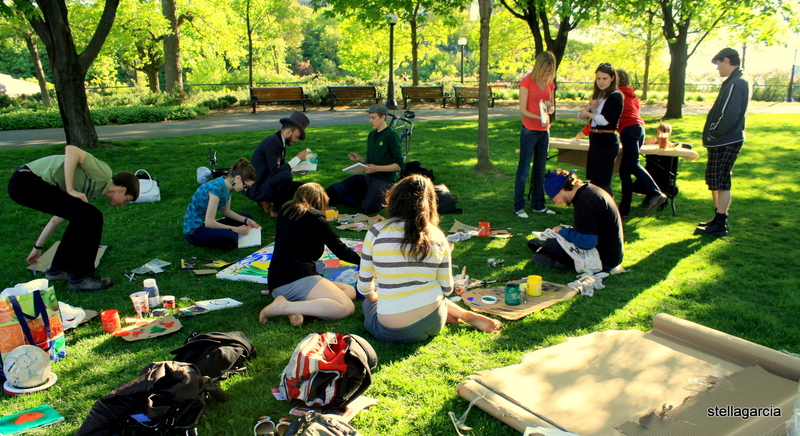 There were two big card board signs that read, “Come Join Us!” next to the walkways inside of the park and lots of people who were strolling down after work did stop by to paint and be creative. The canvases were quickly brought to life by the vibrant colors and techniques. Most of us were amateur painters, but somehow the final art works ended up being quite interesting. I brought home the small canvas that I painted and the big one to which I contributed to with a bunch of purple swirls will be hung somewhere in the city. Fun, fun, fun! Ottawa ranked as BEST place to live in Canada!